Charles Messier was the 18th century "ferret of comets" who compiled the famous catalog that now totals about 110 objects. Some final additions were made by 20th century researchers, and there's still contention about the identity of M102 and the inclusion M110. Ironically, Messier's primary intention was to tabulate these now-treasured objects so they could be avoided as distractions from the primary pursuit of finding comets. 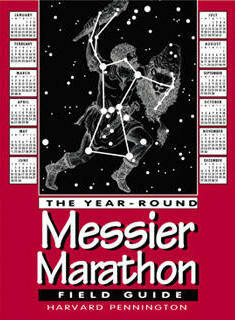 Astronomically, March is the best time of the year for a Messier Marathon in the northern hemisphere (although March weather in New Jersey can be a problem). In brief, the basic concept is to spot all of the objects on the list during a single night, although variations have been devised that may call for multiple nights, doing it with a limited instrument (such as binoculars) to make it more difficult, or for advanced observers, doing it from memory alone. My best Marathon was in 2010, when new moon was on Monday, March 15th at 5:01 pm EDT. Since the weather forecast was excellent for Wednesday night, March 17-18th, I made a Marathon run at Coyle Field in New Jersey. A total of 103 Messier objects were found along with two comets; here's a tabulation. I failed to find M74 in the evening because it was low in the west, and too dim against residual twilight and the Philadelphia light dome towards that direction. In the morning, I failed to find M2, M30, M55, M72, M73 and M75 because I "ran out of gas" around 5:15 am. M30 was probably the only morning object that wasn't achievable had I persisted for another half-an-hour or so. There's also an hour span starting shortly after midnight when I didn't find anything. That's because I was caught up with the available Messier objects and was waiting for the next ones to rise a bit higher, so I decided to look for Omega Centauri, which would transit at a few degrees altitude. The latter effort was unsuccessful, mainly because due south at Coyle Field is towards Atlantic City, NJ, and its light dome. However, Coyle's low horizon's were ideal for the Marathon . I lament that it is no longer accessible to observers, and it won't be in the future (here's a page covering my last session there on the night of April 5/6, 2016). Left: The 12.5" f/5, split-tube Discovery Dob used for the 2010 Messier Marathon, shown at Coyle Field on October 7, 2015. As seen here, as well as for the 2010 Marathon, the scope is strictly manual. The only pointing aid is a Rigel QuikFinder reflex type, which projects a red bull's-eye on the sky (concentric circles, 0.5° and 2.0° diamter). It's the small, elongated box jutting from the upper-left of the tube. For the 2019 Marathon, new moon is on Wednesday, March 6 at 11:04 am EST, so for most folks, the night of Saturday/Sunday, March 9/10, will be the preferred night, although feel free to pick another night as one's schedule and the weather dictate. Note that the switch to Daylight Time occurs at 2 am on Sunday, March 10, although it doesn't alter the length of the night, just the bookkeeping if you record local time. This new moon is slightly on the early side for the Marathon, which helps with M74 in the evening. On March 9, the moon sets at 8:58 pm EST for 40°N-75°W and will be 10% illuminated at 8 pm. However, M30 will be well-nigh impossible in morning twilight from our latitude. There's also a new moon on Friday, April 5 at 4:50 am EDT. Postponing a month would make the initial evening objects more difficult, but M30 becomes a slim possibility (it rises near the start of twilight). In addition, as homage to Messier, I like to include one or more comets when doing the Marathon if possible, so here's Bob King's (S&T) preview of 2019's currently-known comets. As of mid-February 2019, C/2018 Y1 (Iwamoto) is the brightest comet available and was easily seen with binoculars before the moon interfered. It reached perihelion on Feb 6 and was closest to the earth on Feb 12, so it is now dimming, hopefully slowly. Iwamoto should still be accessible with binoculars after the Full Moon on February 19, and will likely be visible without too much difficulty during the Marathon. On the nights of March 5 through March 9, it will be within a couple of degrees from third magnitude Hassaleh (Iota Aurigae), which marks the southwest corner of the Auriga pentagonal stick figure. Update 24-Feb-2019: Comet Iwamoto was spotted with 15x56 binoculars from Carranza Field around 10:30 pm, but it was at the threshold of visibility. Likely, it will be a telescope-only object by the night of March 9/10. Update 25-Feb-2019: Comet Iwamoto was observed with a 12.5-inch reflector at Carranza Field around 10:15 pm. It was fairly dim, so by the night of March 9/10, I fear that it may not be a suitable target during the Marathon, particularly for those not accustomed to finding and looking at dim comets. I've prepared a print-ready, blank PDF log sheet based on Harvard Pennington's sequence from his book, The Year-Round Messier Marathon Field Guide, which is not only an excellent primer on the Messier Marathon itself, but also on the use of the geometric method for easily finding the objects manually. It's useful not just for the Marathon, but any time of the year searching for Messier objects, and ultimately, the method can be applied to any celestial object. The log sheet can also be used any time of the year. The sequence won't change, but the starting point will, and a changing block of objects will not be visible depending on the position of the sun. While the sequence on the log provides a sensible plan of attack based on setting times in the beginning and then rise times later on, it needn't be followed slavishly. Note that on my 2010 log, eleven objects were seen out-of-order before the end of astronomical twilight by taking advantage of them being relatively bright. I've also discovered that when there's trouble finding a given object, don't linger too long on it. Instead, move on to the next object or two, then come back after clearing one's mind of the difficult object.